Thanks for posting, imoldernu & Nords. Amen, and add 911 below those words. My father in law was a Seabee in WW2, he says they were still cleaning up parts of Pearl Harbor in mid-1944, he did so temporarily while awaiting assignment. 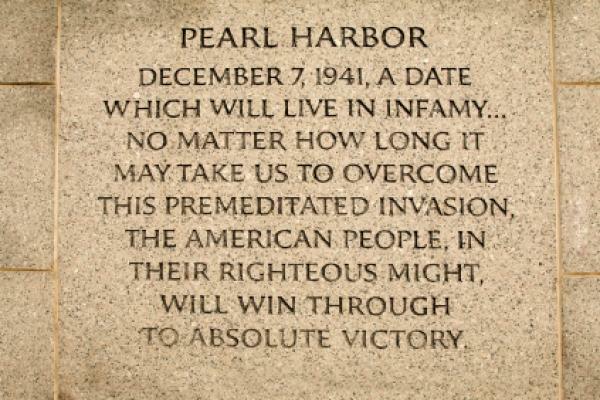 I remember the announcement of Pearl Harbor over the radio. I assumed on December 7. As I recalled it, the president spoke, but that certainly was not the case. It was a news broadcast, at dinner time, probably 5PM E.T. My mom cried, and my dad swore... (he never swore). I was lying under the china cabinet, my hidey place for listening to radio... age five. In fact, it was not President Roosevelt on the radio, since he didn't announce the attack until the next day, December 8th... when he addressed Congress with the famous "infamy" speech. What is little noted, was that Eleanor Roosevelt spoke to the nation, in the evening, on the day before... December 7th. A speech that is still taught in journalism school. For any interest, this site speaks to this, and has pictures of the original draft of that speech with handwritten notes. That was before our time but I've seen enough documentaries to get a feel for what it might have been like -- for civilians, I'd never presume to understand how it was like for the young military guys. I put out the flag today. I was five years old at the time of the attack and don't remember any details or radio messages. I do remember a lot of commotion in our family and mom and dad being very upset. A year later I started grade school and from that time on my memory became sharper. I remember a lot from my early years in school. I also flew the flag yesterday. It's an easy day to remember as it is also my oldest grandson's birthday, the one in the Navy. His dad is a Marine and it all ties together nicely.